Wanna take your Facebook ads to the next level? Check out this video by Chuck Grimmett, the CTO at Praxis. In this detailed video, Chuck shows you how to send custom conversion events to Facebook whenever a visitor, lead or customer engages with one of your website’s calls-to-action – all without having to touch your website’s code. By tracking custom conversion events in Facebook, you can then start optimizing your ad campaigns to achieve the goal of your custom conversion events. For example, instead of optimizing for a specific page view, you could optimize for generating a lead, trial signup, customer, etc. You’ll also be able to track the results of your custom events in Facebook, within the Data Sources section. Beyond optimizing how you measure the performance of your ad campaigns, tracking custom events in Facebook also allows you to create ad campaigns targeting audiences that have achieved the goal of that event, as well exclude audiences from your campaigns that have or haven’t achieved the goal of a custom event. This is powerful. By creating segmented retargeting audiences for each step of your funnel, you can then start to show the right ad, to the right person, at the right time. 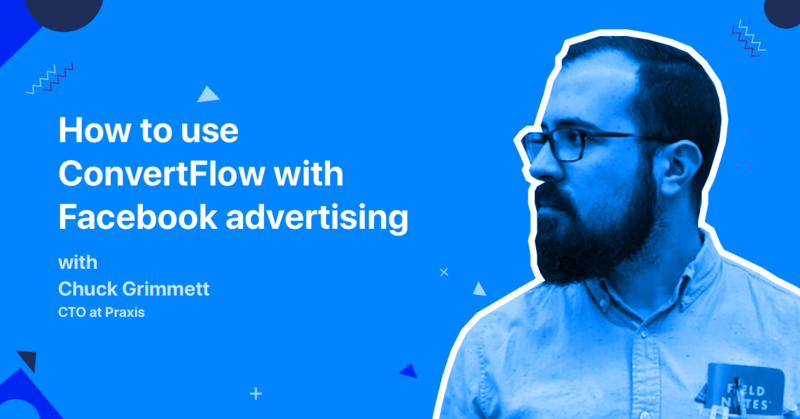 If you’re not already using ConvertFlow to improve the performance and ROI of your Facebook ad campagins, then we highly recommend you watch this video. Shout out to Chuck from Praxis for filming a great video, and for showing us all on how to use ConvertFlow to get even better results from our marketing. Thanks Chuck!